7 Places To Buy Affordable & *Gorgeous* Celeb-Style Juttis For Your Wedding Day! There is a reason why Fizzy Goblet is a favourite among Bollywood fashionistas like Sonam Kapoor and Anushka Sharma! This couture brand is famous for its pretty intricate embellishments, hand embroidery and gota patti work! They have a great collection of contemporary juttis. Crafted beautifully by artisans across India, these feature intricate designs and thread work, and look great with heavily embroidered wedding outfits. Their beautiful colour combinations, exceptional embroidery and handcrafted elegance is hard to resist. From pom pom juttis to ghungroo ones, you can take your pick, they have it all here. Price Range:Rs 1300 to Rs 2500. Each pair is a story of beauty and romance, entwined with fine threads of silk, silver and gold. We accept, they come with a higher price tag, but each pair is like a piece of art in itself and totally worth it. 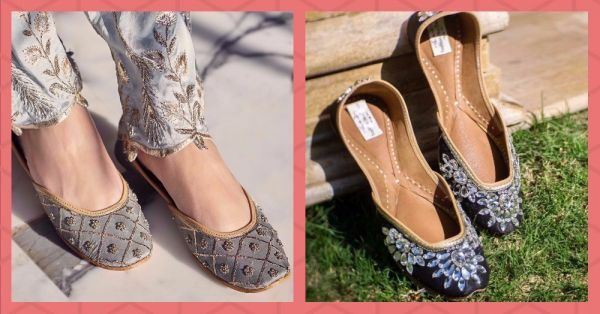 At Tradition Meets Trends, you can choose from a wide variety of sparkly sequins, crystal studded juttis and modern colour block mojris. We bet, you’ll be spoilt for choice at this online store. Since they do not have a website, you’ll have to direct message them on Instagram for price details. Vian has the most gorgeous collection of colourful juttis that will be perfect for your mehendi or even your sangeet function. We love their imaginative use of cut, colour, fabrics and intricate thread work in each pair. This pink ghungroo jutti is definitely one of our favourites. Raunak store is like a digital jutti museum in itself. It has one of the best collections of bright and quirky aztec print mojris that we are a fan of. They even have pearl embedded juttis that can be a great footwear choice on your shaadi day. Do message them on Instagram for pricing enquiries.